Sunshine Coast driver Damian Assaillit's attack on the 2008 Fujitsu V8 Supercar Series will see his car backed by series sponsor Fujitsu General Australia P/L. Prepared and run time by Race Image Motorsport, the Fujitsu Racing Ford will not only enjoy the backing of the Air-Conditioning giant, it will also receive support from Dwyer Quality Homes and assistance from Britek Motorsport and in particular V8 Supercar star Jason Bright, who will act as a mentor to the youngest driver in the field. The seven-round Fujitsu Series runs on the same weekend as the main V8 Supercar Series, as well as an independent round at Wakefield Park outside Goulburn in NSW. It's a major boost for the aspiring 18-year-old racer, who has just completed his first year in the Fujitsu Series. "This is a great opportunity and I plan to make the most of it," said Assaillit. 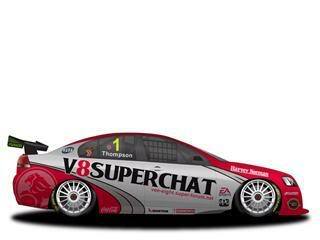 "To work with the Race Image team, as well as call on the assistance of Jason Bright is going to be of great benefit. "I want to forge a career in V8 Supercars, but I know that I still have a lot to learn. I'm not setting my sights on going straight to the front, but over the course of the year I want to improve. "The Fujitsu Series has around 40 cars at every round. It's very competitive and winning the series has provided a number of drivers the opportunity to graduate to the main series. That's what I want to achieve over the next few years. "Having a leading brand in Fujitsu backing our car does bring a lot of responsibilities and I'm fully aware that I have to give them back outstanding value on and off the track. "Our first race is the Clipsal 500 in weekend on 21-24 February - I can't wait!" Britek Motorsport Managing Director Jason Bright was delighted with the choice of Assaillit for the Fujitsu Series. "Damian is a good young racer," said Bright. "He has the raw talent, now it has to be harnessed. That's something that will come with time. What I really like is the fact that he wants to learn and not just charge ahead. He has a very cool head on young shoulders; that's something that's very hard to find. "Our part in the deal is to provide input on his driving and develop his race engineering skills. That's critical in understanding how to get the most out of these cars. That side is all down to experience and that's where he will benefit from working with both me and our engineering group. "The Fujitsu Series runs around half the weekends we do. I have invited him to come and observe how we work on those weekends, as well as give him an open invitation to our other rounds as well. "The responsibility of not only racing with the Fujitsu name on the side of car, but also representing the company can be a tough ask. Again I believe Damian will be as a great an asset off the track as he will be on it." So that's good, another Britek driver on the roster. I think Assaillit can do a really good job as long as he doesn't crash too much. Otherwise Brighty will say no, and he doesn't want that. I think he will do very well, but he'll surely be either Brighty's or Marshall's partner for Bathurst right? Then who'll be Brights partner?